How to remove the top-right corner error mark from the GridCell by pressing Esc key when validated by handling the CurrentCellValidating event? In the SfDataGrid, validation can be done by handling the CurrentCellValidating event. 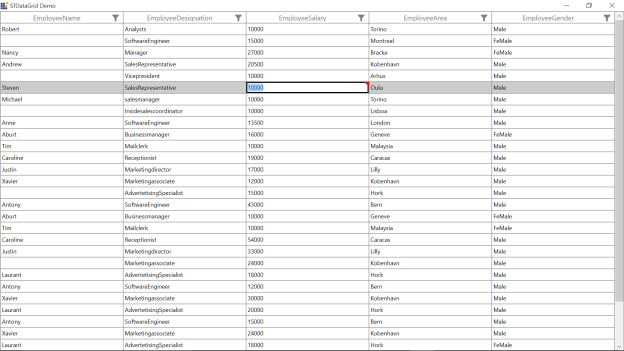 The SfDataGrid does not allow the end-user to move to the other cells until the validation succeeds. In a meantime, you can move to the other cells after pressing Esc key that resets the validation status and error message at the top-right corner. It is possible to reset the validation status when the end-user presses Esc key from the edit mode by overriding the GridSelectionController. In the following code example, the validation status and top-right corner error indication is reset by invoking the ValidationHelper.ResetValidations method on pressing the Esc key by overriding the ProcessKeyDown method of the GridSelectionController. Note: You need to override the GridCellSelectionController class when the SelectionUnit is GridSelecionUnit.Cell.